This article is 2760 days old. The second annual Culture Days takes place this weekend in Windsor/Essex and across Canada! Aiming to raise awareness, participation, and engagement in the arts and cultural life of Canadian communities, the grassroots cross-Canadian celebration represents the largest ever collective public participation campaign undertaken by the arts and cultural community in Canada. On the heels of Culture Days’ 2010 success, this year, 800 communities will take part, that’s 100 more than last year, and Windsor is part of the action! Over thirty five activities are scheduled in Windsor and Essex County including art shows, studio tours, street festival, human library, an art scavenger hunt, and more! 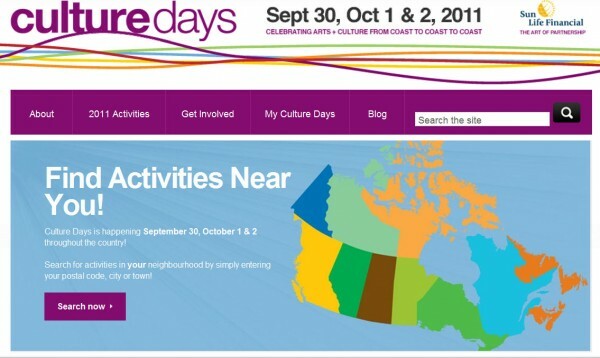 To see all that’s going on and plan your weekend, check out the Culture Days website.